Castella is a sweet, moist sponge cake. 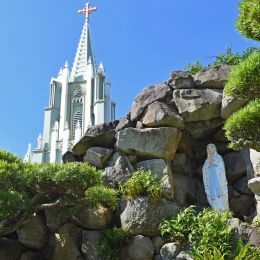 Based on a recipe originally introduced by Portuguese missionaries in the mid-16th century, and then developed by the people of Nagasaki, it is now a popular item. Momo Castella, a peach-shaped version of Castella, is another popular Nagasaki cake. It reflects the Chinese belief that peaches bring good luck. It is just one of a range of delicious Nagasaki sweets that combine the best of Japan, the West and China.